Have you written a thank-you letter to a friend who introduced you to a potential employer or mentor? When you are searching for a new job, having connections who provide introductions or referral letters is extremely valuable. An introduction is the first step towards expanding the pool who know you and, hopefully, like you. Follow up with a letter or email to say thank you for an introduction. It doesn't have to be lengthy, just long enough to demonstrate that you truly appreciate what your friend or colleague did for you. People like to know when others appreciate what they’ve done for them and that may leave them wanting to help you even more. Taking the time to show appreciation may lead to further referrals. Writing a thank you letter for the introduction is important whether or not you get a job or mentorship directly from the introduction. You may have been disappointed that the introduction didn't produce any job leads. That is understandable. But consider those first introductions often lead to more introductions. You need to thank the person who made the referral, so they are prompted to think of further referrals. Besides, it’s always a good idea to build up your network, and any introduction is worthy of recognition and appreciation. You may also be surprised when the contact you made leads to opportunities further down the line. Be sure to send a thank you to the person you were introduced to and keep your chain of contacts growing. Here’s an example of why writing such a letter is so important. Let’s say Jacob introduces you to Sunita, who is a manager at a tech firm where you are interested in a position. You have a good conversation with Sunita about careers at her company, but it turns out there are no openings that fit your skill set at this time. Despite your disappointment, you write an email to Jack thanking him for making the introduction. And while you’re at it, don’t forget to write an email to Sunita, thanking her for the conversation (be sure to include your contact information). Jack appreciates the fact that you recognized him for the introduction and he thinks about other colleagues out in the workforce. His next introduction is to a manager who has an opening for which you are qualified. He might not have made the connection without the thank-you note. But it doesn’t have to stop there. Let’s say that a few weeks later, Sunita hears of an opening in another branch of her company that’s a good fit for you, and she thinks of you and contacts you to let you know about the potential job. Your thank you note to her, with your contact information, could have been the trigger that kept you in her mind. Be sure to write a second thank you to Jack when the introduction he made produces a result. This will ensure he remains a good source of referrals for future opportunities. If you haven’t written this type of letter before, you can use this letter as a template. Edit this letter with details that fit your personal and professional situation. Thank you so much for putting me in touch with Lindsay Weston of ABC Marketing, Inc. We spoke on the phone last week, and she gave me some great advice on how to best market myself when applying for entry-level marketing positions. I continue to look for that perfect job opportunity, so if any other leads come your way, please pass them along. Hopefully, your introduction will turn into a lead and an interview, and it’s important to thank the person who introduced you, the person who interviews you, and any other people that play in important role in your landing a new job. 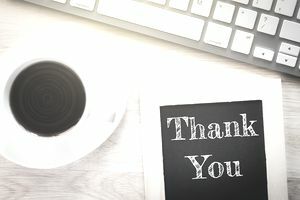 How to Writing Thank you Letters: including who to thank, what to write and when to write an employment-related thank you letter. In addition, look over these sample thank you letters including thanks for a job interview, an internship thank you letter, thanks for the informational interview, thanks for help, and a variety of additional interview thank you letter samples.